Another little bonus to this recipe is that it was actually really cheap to make. 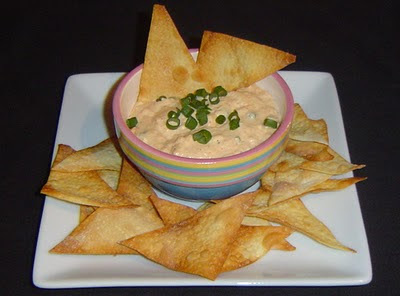 This recipe yields about 2.5-3 cups of dip. I had to buy everything for it and the total came out to about: $8.50. Now I have Sriracha, Seasoned Salt, and Cayenne pepper on hand, if you don’t it will be a little more. So this would be great for about 4-6 people and easily doubled for more. 1. Remove crab from can, drain, then lightly rinse and press out excess water. 2. In a mixing bowl add all your ingredients and stir to incorporate. 3. Transfer to a heatproof dish and bake at 350 for 20 minutes. 4. Remove from oven, stir and serve. 1. Remove wraps from package and cut diagonally. Cut however many you plan on eating. 3. Bake at 350 for 5-8 minutes until lightly golden brown. *Both the oil and salt are optional. I liked that it gave it a bit more flavor and chip likeness but you can skip it. This dip seemed rather delicate to be honest – in a good way. It wasn’t overpowering, just simple and tasty. The crab had a lovely, subtle flavor, the onions added a good balance to the crab’s sweetness, and the heat hit you nicely at the end. The heat wasn’t too intense, which is what I wanted, but you can always up the level if you choose to. The wonton chips were really interesting. They almost played tricks with your mouth. The first few bites, mine was saying: “Is this a chip? It kind of taste like a chip, but it has the texture of a wonton. What is going on here? ?” They were really light and not greasy or heavy feeling, even with a tiny amount of oil brushed on them. Sam was right about them being a healthier choice. One ounce of plain wonton wrappers has 0.4 grams of fat and only 82 calories, but adding the oil will add a little more. If you don’t want to use the wonton’s you can substitute crostini, bread, or regular chips, but I think these complimented each other so well that you should really give it a try. i like to add a bag of thawed salad shrimp to my crab rangoon filling. they might work here too!